Did you know that products we use every day may contain toxic chemicals linked to women’s health problems, like breast cancer, reproductive harm like infertility and birth defects, asthma, and other serious illnesses? The good news is that WVE has done the research for you on effective ways to reduce your exposure to harmful chemicals in everyday products—and to get rid of toxic chemicals all together! 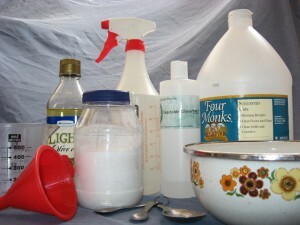 It’s easy, fun, and cheap to make non-toxic cleaners from safe and effective ingredients like vinegar and baking soda. Find recipes here. THE FACTS: Certain chemicals in cleaning products have been linked to reduced fertility, birth defects, increased risk of breast cancer, asthma, and hormone disruption. Shop for cleaners, laundry detergents, and personal care products labeled “fragrance-free” Warning: “Unscented” does not always mean fragrance-free! Don’t use air fresheners. Click here for tips to reduce odors around the home naturally. THE FACTS: Fragrance can be made up hundreds of chemicals, which companies are legally allowed to keep secret from consumers. Common fragrance chemicals include phthalates (linked to reproductive and developmental harm) and synthetic musks (linked to increased risk of breast cancer). Read the label to avoid chemicals like parabens, sodium laureth sulfate, and oxybenzone. Check the Skin Deep database at www.cosmeticsdatabase.com to find safer products. Use fewer products, and use them less frequently to reduce exposures. THE FACTS: Personal care products contain a wide variety of chemicals, including some known to be of concern, and many that lack research to prove safety for women’s health. These products are applied directly to our skin where they are easily absorbed into our bodies. Ditch the canned foods when possible and opt for fresh or frozen fruits and vegetables instead. Look for products packaged in glass or lined cardboard instead of cans. THE FACTS: Bisphenol-A (BPA) is commonly found in can liners and plastic products. and coated on paper receipts. BPA exposure is linked to a host of hormone-related health impacts such as increased risk of cancer, infertility, obesity and diabetes. And unfortunately, recent studies find BPS -- BPA's replacement chemical -- isn’t any safer than BPA. Learn more. Reduce your use of disinfectant products. THE FACTS: Quats are skin irritants, can irritate your lungs and have been linked to asthma, fertility issues and reproductive harm. The over use of quats can also lead to the promotion of antibacterial-resistant bacteria (“super-bugs”). Use glass jars or ceramic bowls to store food. Never microwave plastic. Wash plastics by hand – not in the dishwasher. Avoid plastics with recycle symbols #3 (PVC), #6 (polystyrene), and #7 (other) which have greater potential to leach toxics and are difficult to recycle. THE FACTS: Plastic products can contain toxic additives such as phthalates, heavy metals and other compounds which leach out over time. Polyvinyl chloride (PVC), known as the poison plastic, is found in plastic products from toys and cookware to shower curtains. Take of your shoes before entering your house to avoid tracking in oils and chemicals from the street outside. Use a door mat to catch dirt at the door. Dust with a micro-fiber cloth or wet cloth and vacuum your house regularly (with a HEPA-filter vaccuum if you can). THE FACTS: Shoes can track in toxic chemicals like lawn pesticides, coal tar from a driveway, etc. Dust carries harmful chemicals that shed off of household furniture, electronics, and other household products. Keep the stove at or below medium heat when using Teflon or non-stick cookware. Opt for cast iron or stainless steel pans for cooking when possible. THE FACTS: Teflon releases perfluorooctanoic acid (PFOA) when heated to 450 degrees. PFOA is linked to developmental harm and cancer. Eliminate odor – Identify the smell and eliminate or prevent it. Check out our tips for reducing odors around the home. Open a window – Ventilating your home with outdoor air has been shown to reduce symptoms associated with asthma, allergies and infections. Set out a bouquet of fresh or dried flowers to add a floral scent to your home. Simmer herbs or spices on the stove. Try seasonal alternatives like pine cones, pine needles, or cinnamon. THE FACTS: Air fresheners add unnecessary chemicals to your home including ones that may disrupt your hormones. Exercise your power to ensure a healthy future! Sign up to receive action alerts, latest news, and tips for reducing toxic exposures. Donate to our work to eliminate toxic chemicals that harm women’s health.